In the Taoist meditation tradition, stress reduction is a critical first step. Early stages of meditation are about teaching you how to relax and balance the energy flows inside your body. Stress destroys chi (qi), leaving people unbalanced, erratic, unfocused and sometimes unstable. Stress breaks down the body and mind. Learning and practicing Tai Chi and Bagua builds the ability of the body and mind to maintain relaxation, presence and balance. The result is an increased ability to both manage stress, and engage in successful meditation. Once you can manage the stresses of daily life, the subject of the complete spiritual unfolding of the human soul can be addressed. If people cannot manage the simple day-to-day stresses of life, the idea that anyone can become spiritually evolved is little more than wishful thinking. During times of stress, the nerves go from having an ideally balanced, even, and coordinated flow to having irregular and uneven spikes. The mind either becomes agitated and frenetic (or even manic), or subdued and depressive. When that occurs, the body may produce adrenaline and other destructive hormones as a defense mechanism. The process can become habitual as a result of repeated stressful catalysts, creating a negative feedback loop. Bagua’s method of regulating these spikes is to Walk the Circle while holding one hand in front of your eyes and continuously looking at your index finger (the Upper Body Palm Posture). While doing this simple physical act, you keep your focus either on your finger or the rhythm of your walking. In time, this smooths and steadies the nerves. If your nervous system spikes or your mind drifts, the weight of your arm and your need to stay walking your circle will help bring you back into focus. A seesaw effect is thus induced between constantly losing and regaining your focus. In order for you to accomplish the tasks of staying on your circle and watching your finger, through repetition your mind will eventually find a way to relax and open up. However, the only way your mind can truly open is by having the signals in your nervous system become steady. So, you continue Walking the Circle. The focus of the mind is particularly strengthened as you change direction or alter your speed. 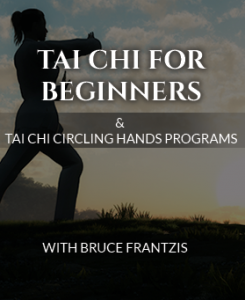 Tai chi’s approach to smoothing the spikes of the nervous system is to establish steady, rhythmic patterns of movement that progressively relax and soothe it. Your mind becomes trained to stay focused on performing the myriad details that are required by each movement. If the mind jumps or drifts, or your nervous system spikes, you’ll be thrown off the sequence of movements. Then you’ll realize you need to refocus and get back on track. As bagua and tai chi strengthen the nervous system, you will notice a reduction in the frequency of instances when your nerves become over-stimulated. This is because your nervous system is growing stronger and more stable. Avoiding over-stimulation allows your mind to remain more quiet, calm and focused. A major problem with stress is that the mind loses its ability to be nimble and agile, so you are more inflexible and easily fixate on one idea or another. This is especially true for expectations or desires. When suddenly confronted with upheaval, the emotions can take over and freeze your ability to act. That is why many stress management programs are geared toward helping people learn to accept situations for what they are and to find a way out of their self-imposed mental boxes. They aim to teach people how to respond appropriately to the needs of the moment rather than getting stuck in endlessly churning mental loops. Bagua and tai chi do the same: They are great stress management tools for helping you stay in the moment and not gap out. When you practice bagua or tai chi, you must constantly change your physical orientation. You adjust where your eyes look and your head faces, moving from place to place in a very steady way. You are meant to do this without getting stuck in the middle of a movement. If you find yourself physically stuck—or more importantly, emotionally or mentally stuck—your movements will immediately become rigid and you may even forget what you are doing. At this point, you try to quickly get back on track, smoothing your mind and emotions so that your physical movements can once again become continuous. Over time, your focus will grow and stabilize, and your emotions and mental churning become less predisposed to roller coaster rides. In the process of constantly smoothing out the physical and energetic movements within your bagua or tai chi practice, you train your mind to become more flexible. Your mind has no choice but to constantly adapt to physically transiting between where it was and where it will be. Eventually, you give up some of the attachments associated with inflexibility, such as: “This shouldn’t be happening”; “This can’t be happening” or “Something else should be happening.” Practicing the movements gradually trains your mind to let go of places where you habitually get stuck, thereby creating a more agile mind. Bagua and tai chi also help you develop a sense of internal cohesion and whole-body awareness, physically and mentally. In order to coordinate and align all moving parts—hands, feet, waist and twisting motions—you must have a strong center. Fulfilling the physical requirements of bagua’s Single Palm Change or a tai chi form requires you to move your body as a connected whole rather than a series of loosely connected or uneven jerky parts. Your mind must also be coherent: constant, stable and focused. In order to smoothly navigate the continuously changing movements, bagua and tai chi naturally stimulate the development of a strong, psychological center within you. 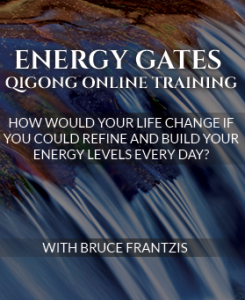 Over time, it fuses into the physical and energetic center of the lower tantien. Many people have the sense that they’re one kind of person in one situation and a different person in another. They do not have an overriding sense of continuity between the moments of their life because there is minimal constancy or cohesion of mind. 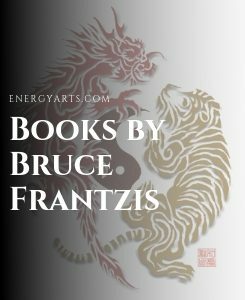 Bagua, with its constant Circle Walking and changing directions, or tai chi with its constant waist turning and shifts from one movement to another, gives you a process that accustoms the mind to making changes while remaining internally cohesive. You don’t accomplish this by only thinking and philosophizing about it. You must learn how to do it. In time, by undergoing physical training with continuously repeating movements, your mind will progressively unify and move through the changes without instigating a stress response. You try not to fixate on a single idea of what being ‘centered’ means. In fact, your sense of cohesion and center being more amorphous will more smoothly link and hold everything together within you. Then no matter what you’re going through, you can handle it without effort or strain. The complex nature of bagua and tai chi’s movements eventually leads to a sense of whole-body connectedness or awareness. At first, you mentally think of specific movements—keeping a hand at a certain height, changing positions, moving your foot or hip and a myriad of other physical details. Because you have to think about the movements, a fusing of the body and mind occurs. Combined with attention to the 16 neigong components, your ability to feel and be aware of your entire body naturally develops. In order to accomplish so many things at once, your mind must relax and remain open to encompass effortless multitasking. Without developing some degree of internal mental cohesion, whole-body awareness is impossible to attain. From the other side of the coin, training to achieve whole-body awareness must, of necessity, increase your internal cohesion. These are the qualities necessary to practice the beginning stages of Taoist meditation. Click here to learn more about our Taoist Meditation program. At the simplest level, meditation is about settling the mind so it is capable of deep and powerful focus. Bagua and tai chi, like Zen Buddhism, accomplish this by teaching you to sink your body’s chi into the lower tantien. You draw your mind’s awareness inward and downward where eventually—with much personal refinement—it becomes stable and awakens the body’s central channel of energy. Bagua and tai chi’s foundational meditation practices are designed to develop a mind that is attentive, focused, relaxed, balanced and stable, which creates a relaxed body. Although it is possible to have a relaxed mind inside a tense body, it is definitely easier and more sustainable to relax the mind within a relaxed body. Bagua and tai chi use strategies for developing an integrated, relaxed body and mind. Tai chi focuses on the space inside your body. Within regular, rhythmical, slow movements that naturally relax your body, your mind must concentrate on the many movements, chi flows and physical details of the form. The only way your mind can pull this off is by relaxing and opening. This is a first step in using meditation methods to tap into the tai chi space of emptiness that is beyond opposites. You must also focus on the empty space in between the yin and yang when you make the changeovers. Tai chi is about smoothly alternating your moves with a very steady rhythm. In bagua, you intensely focus your attention internally and externally while continuously changing direction and speed. The aim is to physically and mentally move through change without resistance, which is only possible through relaxation. Bagua focuses on what is happening physically and energetically as you make each change and shift between yin and yang, often in the blink of an eye. Internally and smoothly moving through change, regardless how slow, sudden or unpredictable, is bagua’s specialty. All genuine Eastern practices—including martial, healing and meditative arts—contain a very simple idea: Don’t be in a rush to go to the next step. Weak foundations easily create crumbling buildings. And, you don’t build a house from the third story down. Because we live in an acquisitive society that emotionally rewards people for the amount of their possessions—whether material or intellectual—many students do not realize that body/mind/spirit skills require a very different approach. Skills in the Eastern arts are carefully and progressively crafted. End goals involve building and balancing chi and moving toward spirituality, so you can’t skip the basics. In the West, many students of chi practices like to collect movements, sets or energy arts the way a child would marbles. However, in China the focus is not on how many marbles you have, but how well you understand and can use them. The race to develop and flaunt superior abilities, to pile up skill upon skill, and to aggressively compete in their acquisition are forms of spiritual greed. They are the antithesis of the Taoist ideals of balance and compassion. Greed for knowledge of chi drives many to attempt advancing to step 3 before they have learned steps 1 or 2. Practitioners of Taoist arts must put away whatever fantasies they might have about the rewards of jumping ahead before they’re ready. Taking the time necessary for learning all the nuances of each new step is what creates a strong foundation. 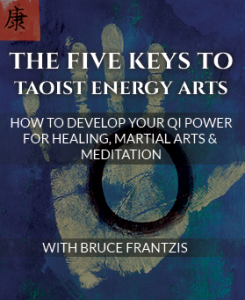 For the average bagua or tai chi practitioner interested in exercise, the basic meditation practices the arts contain will serve primarily as a means to manage stress and calm an anxiety-driven mind. Yet with practice, almost everyone will experience the odd moment when they catch a glimpse of their spiritual essence. They are suddenly left within themselves. A residue of inner peace may remain that is more profound than most people experience in a lifetime. In Taoism, this is what is called the “wonderful accident.” Such experiences often inspire people to commit to engage in the more advanced practices of Taoist meditation. Click here to learn more about our Taoist Meditation program. For me anyway, with connective tissue disorder, neurological problems and CFS. Walking problems preclude me from tai chi. The spiritual element is missing in aquarobics though the uplifting result is feeling more connected to body post-exercise and improved self esteem.